This week has flown by, it helps that I took Monday off =p. I had an amazing anniversary weekend with my honey, it was great to get away from it all. The leaves are starting to change so I guess I can't resist Fall any longer. I busted out my first polish from the 2010 Fall China Glaze Vintage Vixen Collection. I thought Classic Camel would make a good color for the start of the season. This cream is literally the color of a camel, a tannish toffee with gold shimmer. I used Seche Rebuild, a BC. I really, really like this color! I think it fits this time of the year well. 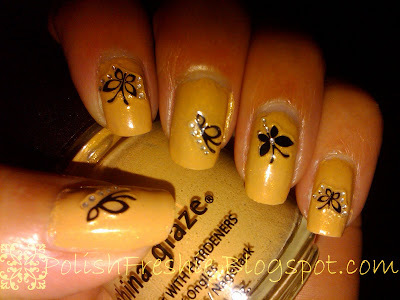 I spiced it up with some Viva La Nails butterfly stickers. Some of the stickers went well on my rounded nails and some of them were a disaster! I could feel the edges sticking up and even some parts of the stickers have ripped off. Two coats of China Glaze Fast Forward didn't smooth them out. Not sure if I did something wrong but I wasn't that impressed with them. Maybe my nails are just too round? I could wear this color for a few more days but since the stickers are driving me CrAzY they're coming off tomorrow. Have you been in the mood for fall manis? It's so pretty on you!! & all the Viva La Nails things I have used haven't really stayed on my nail for very long lol. It's not just your stickers. I find that a lot of brands don't allow the stickers to bend enough for rounded nails. It's crazy how stiff some stickers are. They are terrible to work with. I do like that colour on you though. It's not my kinda color, but cute mani! Think I got the same stickers from them, but haven't tried them yet. I got this color too but I don't like it so much, way cute with the stickers on you! I'm glad you had a good anniversary weekend! Thanks Katrina! I haven't tried any of the others, hopefully they're better. Thank you Rebecca! What are they thinking? Nails curve a little on everyone. Shiny I didn't think I'd like it either but I really do. Holos are always a good choice, been wanting to try my Color Club's. Aggie - I think it's a hit or a miss. Thanks so much xoxo! This is GORGEOUS! I love all your nail polish looks! Chic Geek ~ You're too sweet, thank you!